Klebsiella pneumoniae is an important gram-negative opportunistic pathogen causing primarily urinary tract infections, respiratory infections, and bacteraemia. The ability of bacteria to form biofilms on medical devices, e.g. catheters, has a major role in development of many nosocomial infections. Most clinical K. pneumoniae isolates express two types of fimbrial adhesins, type 1 fimbriae and type 3 fimbriae. In this study, we characterized the role of type 1 and type 3 fimbriae in K. pneumoniae biofilm formation. Isogenic fimbriae mutants of the clinical K. pneumoniae isolate C3091 were constructed, and their ability to form biofilm was investigated in a flow cell system by confocal scanning laser microscopy. The wild type strain was found to form characteristic biofilm and development of K. pneumoniae biofilm occurred primarily by clonal growth, not by recruitment of planktonic cells. Type 1 fimbriae did not influence biofilm formation and the expression of type 1 fimbriae was found to be down-regulated in biofilm forming cells. In contrast, expression of type 3 fimbriae was found to strongly promote biofilm formation. By use of well defined isogenic mutants we found that type 3 fimbriae, but not type 1 fimbriae, strongly promote biofilm formation in K. pneumoniae C3091. As the vast majority of clinical K. pneumoniae isolates express type 3 fimbriae, this fimbrial adhesin may play a significant role in development of catheter associated K. pneumoniae infections. Klebsiella pneumoniae is an important gram-negative opportunistic pathogen causing primarily urinary tract infections (UTIs), respiratory infections and bacteraemia especially in immunocompromised individuals . Next to Eschericia coli, K. pneumoniae is one of the most frequent causes of catheter-associated urinary tract infections (CAUTIs). The high incidence of CAUTIs has significant costs. Besides the economic aspect due to extended hospital admission days, the infection can spread to the kidneys and bloodstream causing systemic disease including bacteraemia [2–5]. The ability of bacteria to form biofilms on medical devices, e.g. catheters, is believed to play a major role in development of nosocomial infections including CAUTIs [2, 5–7]. Biofilm formation, i.e. bacteria form an organized matrix-enclosed community adhering to the surface and each other, provides enhanced tolerance to antibiotics and the host immune system compared to growth as planktonic cells. 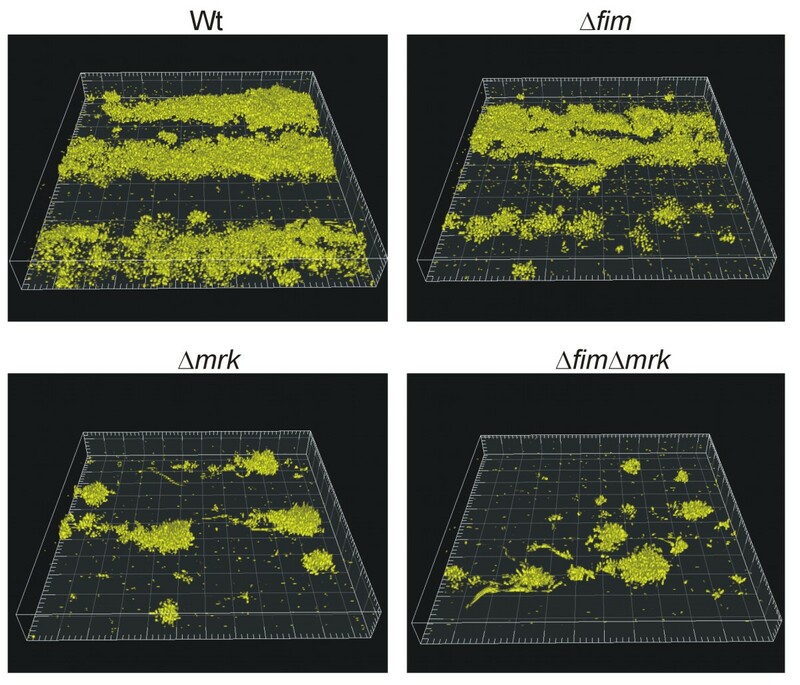 Adhesion to the surface is the first essential step in biofilm formation; but adhesins may also play a significant role in later steps of biofilm development, e.g. by promoting cell-cell contact. Indeed, various fimbrial adhesins have been shown to play a role in biofilm formation in different bacterial species including E. coli, Pseudomonas aeruginosa, Vibrio cholera and Vibrio parahaemolyticus[8–12]. Most K. pneumoniae isolates express two types of fimbrial adhesins, type 1 and type 3 fimbriae . Type 1 fimbriae are found in the majority of enterobacterial species; they mediate adhesion to mannose-containing structures and their expression is phase variable, i.e. mediated by an invertible DNA element (fim switch) . Type 3 fimbriae are present in practically all K. pneumoniae isolates and mediate adhesion to several cell types in vitro [14, 15]; nevertheless, the receptor for type 3 fimbriae has not yet been identified. Historically, type 3 fimbriae have not been associated with E. coli ; however most recently two independent studies have for the first time reported type 3 fimbriae expression in E. coli strains encoded by conjugative plasmids [16, 17]. We most recently investigated the role of type 1 and type 3 fimbriae in K. pneumoniae virulence in a UTI, a lung infection, and a gastrointestinal colonization model [18, 19]. Type 1 fimbriae were found to be essential for the ability of K. pneumoniae to cause UTI, whereas type 3 fimbriae were not essential for virulence in the tested animal models [18, 19]. In the present study we assessed the role of type 1 and type 3 fimbriae in K. pneumoniae biofilm formation. K. pneumoniae C3091 is a clinical urinary tract infection isolate expressing type 1 and type 3 fimbriae [20, 21]. The isogenic C3091 type 1 fimbriae mutant (C3091Δfim), type 3 fimbriae mutant (C3091Δmrk) and type 1 and type 3 fimbriae double mutant (C3091Δfim Δmrk) were previously described including verification of expected fimbrial expression [18, 19]. Unless otherwise stated, bacteria were cultured at 37°C on solid or liquid Luria-Bertani (LB) medium. When appropriate, media were supplemented with the following concentrations of antibiotics: apramycin, 30 μg/ml; and chloramphenicol, 30 μg/ml. To observe biofilm formation by confocal laser scanning microscopy (CLSM), the C3091 wild type and its fimbriae-mutants were chromosomally-tagged by allelic exchange of the lacIZ genes with a cassette encoding fluorescent protein (yellow fluorescent protein (YFP) or cyan fluorescent protein (CFP)) under control of the modified lac promotor PA1/04/03, and chloramphenicol resistance flanked by regions homologous to regions up- and down-stream the lacIZ genes. The cassette was generated by a modification of a three-step PCR procedure as previously described [18, 19, 22]. All primers used are listed in Table 1. As the first step, the fluorescent protein and chloramphenicol encoding cassette was amplified from pAR116 (YFP) or pAR145 (CFP) using primer pair Ucas and Dcas . Secondly, from C3091 chromosomal DNA a 403 bp region and a 460 bp region flanking the lacIZ genes, were amplified by PCR using primer pairs lacIUp-F, lacIUp-R and lacZDw-F, lacZDw-R, respectively. At their 5' ends, primer lacIUp-R and primer and lacZDw-F contained regions homologous to the primers Ucas and Dcas, respectively. In the third step, the flanking regions were added on each side of the fluorescent protein and chloramphenicol resistance cassette by mixing 100 ng of each fragment, followed by PCR amplification using primer pair lacIUp-F and lacZDw-R. The PCR product was purified and electroporated into C3091 wild type or its fimbriae mutants harboring the thermo-sensitive plasmid pKOBEGApra encoding the lambda Red recombinase. The fluorescently tagged strains were selected by growth on LB plates containing chloramphenicol at 37°C. Loss of the pKOBEGApra plasmid was verified by the inability of the tagged strains to grow on LB agar plates containing apramycin. Correct allelic exchange was verified by PCR analysis using primer pair UplacI and DwlacZ flanking the lacIZ region. Biofilms were grown in flow chambers with individual channel dimensions of 1 × 4 × 40 mm supplied with modified FAB medium . The modified FAB medium was supplemented with glucose (100 mg l-1) as carbon source and isopropyl-thio-beta-galactoside (IPTG; 12 mg l-1) to ensure expression of fluorescent proteins from the PA1/04/03 promotor. The flow system was assembled and prepared as described previously . A microscope cover slip of borosilicate (Knittel 24 × 50 mm st1; Knittel Gläser) was used as substratum. The flow chambers were inoculated by injecting approximately 2 × 106 cells, into each flow chamber with a small syringe. After inoculation, the flow chambers were left without flow for 1 h, and medium flow (0.2 or 0.8 mm s-1 corresponding to laminar flow and Re numbers of 0.3 and 1.3, respectively) was started using a Watson Marlow 205 S peristaltic pump and the system was incubated at 30°C. Biofilm formation was monitored by CLSM four, 24, 48, and 72 hours after inoculation. Microscopic observations and image acquisitions were performed with a Zeiss LSM 510 CLSM (Carl Zeiss, Jena, Germany) using a 40 ×/1.3 oil objective. The microscope was equipped with lasers, detectors and filter sets for detecting CFP and YFP fluorescence. Simulated three-dimensional images were generated using the IMARIS software package (Bitplane AG, Zürich, Switzerland). For quantitative analysis of the biofilms, CLSM images were analysed by the computer program COMSTAT . The total amount of biomass on the surface, the relative substratum coverage and the average thickness of the biofilm were calculated. Differences between the wild type and each mutant in the three parameters were compared by using a two-tailed independent t-test. P values below 0.05 were considered to be statistically significant. A modification of a previously described method was used to determine the orientation of the fim-switch in K. pneumoniae biofilms [18, 26]. Biofilm samples were obtained by aspiration of the biofilm from individual flow cell channels by use of a syringe. All inoculum and biofilm samples were boiled for 5 min in PBS immediately after collection and then kept at -20°C until use. After thawing, the samples were boiled for 5 min, centrifuged at 12,000 g for 15 min and 2 μl of the supernatant used as template for PCR. Primers CAS168 and CAS169 (Table 1) were used to amplify an 817 bp region containing the fim-switch by use of the Expand High Fidelity PCR System (Roche). The PCR cycle conditions were as follows: 1 cycle of 94°C for 2 min; 30 cycles of 94°C for 15 s, 52°C for 1 min, 72°C for 1 min; one cycle of 72°C for 7 min. The PCR products were cut with Hin fI and separated on a 1.2% agarose gel. Due to asymmetric location of the Hin fI cleavage site inside the invertible element, different sized DNA fragments are obtained depending on the orientation of the phase switch. To investigate the role of type 1 and type 3 fimbriae in K. pneumoniae biofilm formation a well-defined isogenic type 1 fimbriae mutant (C3091Δfim), a type 3 fimbriae mutant (C3091Δmrk), and a type 1 and 3 fimbriae double mutant (C3091Δfim Δmrk) of the clinical UTI isolate C3091 were used. The wild type and its fimbriae mutants were found to have similar growth rates in the modified FAB medium used for biofilm experiments (results not shown). Biofilm formation was observed four hours after inoculation of bacteria and after one, two, and three days. Four hours after inoculation of the flow-system, single cells of the wild type strain and its type 1 fimbriae mutant were observed adhering to the substratum whereas only very few cells of the type 3 fimbriae and the type 1 and 3 fimbriae double mutant were detected (results not shown). After 24 hours the wild type and the type 1 fimbriae mutant were found to form characteristic biofilms on the substratum observed as long extended colonies in the flow direction (Figure 1). One-day old biofilms of K. pneumoniae C3091 and its isogenic fimbriae mutants at flow 0.2 mm/s. Biofilm formation was examined in three independent experiments with similar results. Box sides 230 μm × 230 μm. In contrast, the type 3 fimbriae mutant and the type 1 and 3 fimbriae double mutant only formed distinct microcolonies. Thus type 3 fimbriae, but not type 1 fimbriae, are important for attachment to the substratum as well as the initial stages of biofilm formation. To investigate the influence of shear forces on biofilm formation, a similar experiment was performed, except the media flow speed was raised from 0.2 mm/s to 0.8 mm/s. Under higher flow speed, the influence of type 3 fimbriae was even more pronounced (Figure 2). The two mutants unable to express type 3 fimbriae (C3091Δmrk and C3091Δfim Δmrk) formed even fewer and smaller colonies. Also the biofilm formation of the wild type and the type 1 fimbriae mutant was influenced by the higher flow speed. 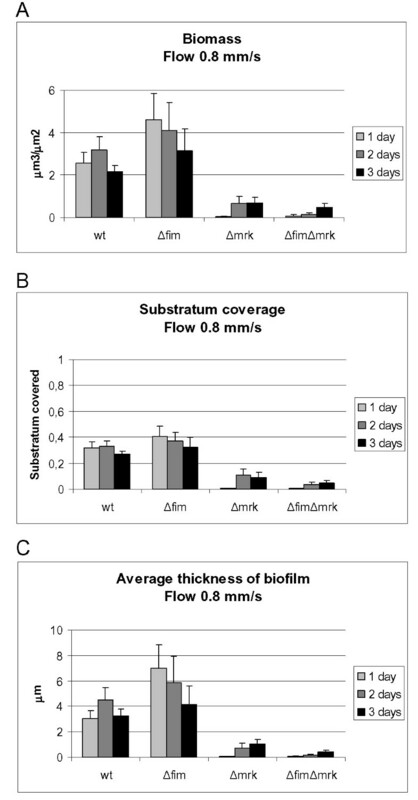 Both cell types formed flat biofilms compared to biofilms under lower flow velocity, likely due to increased removal of loosely attached cells. However, the biofilms were significantly more pronounced and continuous and covered most of the surface compared to the biofilms of the type 3 fimbriae mutant and the type 1 and 3 fimbriae double mutant (Figure 2). In some areas the wild type and type 1 fimbriae mutant covered the whole surface as seen in Figure 2 and in other areas they formed the long extended colonies in the flow direction as observed under lower flow speed. This heterogeneity may be related to small differences in the flow cell micro-environment including lower flow stress due to presence of upstream biofim. One-day old biofilms of K. pneumoniae C3091 and its isogenic fimbriae mutants at flow 0.8 mm/s. Biofilm formation was examined in three independent experiments with similar results. Box sides 230 μm × 230 μm. To further characterize the influence of fimbriae on K. pneumoniae biofilm formation, flow cell experiments were performed with the different fimbriae mutants in direct competition with the wild type strain. For these experiments the wild type strain was chromosomally-tagged with cyan fluorescent protein (CFP). To verify that the YFP- and CFP-tagging did not have any influence on the biofilm formation, equal amounts of the YFP- and CFP-tagged wild type variants were inoculated in the same flow cell. As seen in Figure 3A, the biofilm formation of the YFP- and CFP-labelled wild types was similar. Furthermore, the results indicate that the K. pneumoniae biofilm develops primarily by clonal growth and not by recruitment of planktonic cells, as the biofilm was formed by large colonies of either YFP or CFP labelled cells. If the biofilm was developed by recruitment of planktonic cells, there would be a mix of YFP- and CFP-labelled cells in the colonies of the biofilm. Competition biofilm experiments with K. pneumoniae C3091 and its isogenic fimbriae mutants. The pictures are of one day old biofilms. All biofilms were initiated with a 1:1 mixture of CFP-tagged and YFP-tagged bacteria. Biofilm formation was examined in three independent experiments with similar results. Box sides 230 μm × 230 μm. 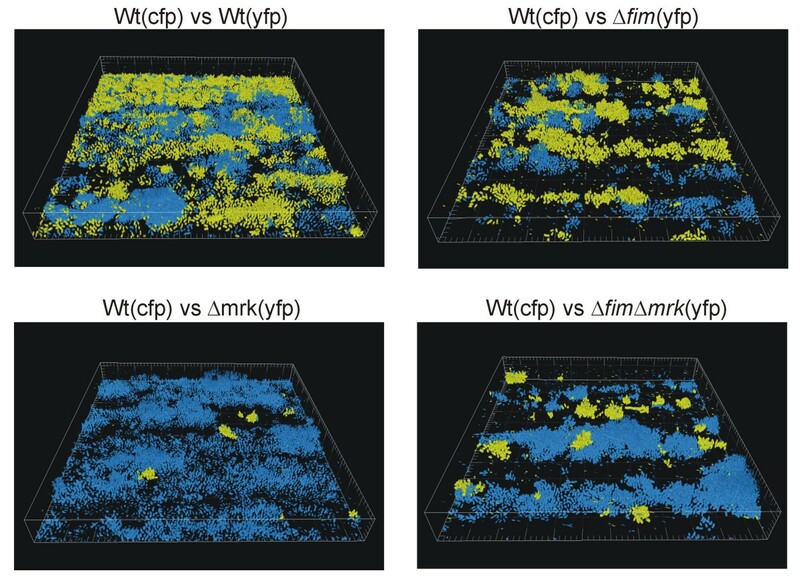 Competition experiments with the wild type and type 1 fimbriae mutant revealed that biofilm formation by the mutant strain were similar to the wild type (Figure 3B). As competition experiments are expected to reveal even minor differences in the ability to form biofilm, this verifies that type 1 fimbriae do not play a role in K. pneumoniae biofilm formation. 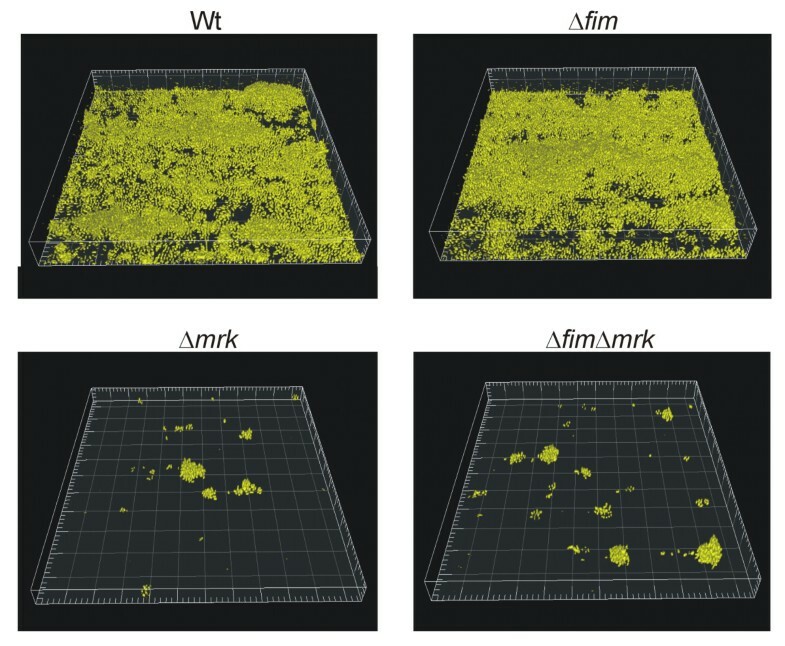 In contrast the experiments with the C3091Δmrk and C3091Δfim Δmrk mutants in competition with the wild type show a pronounced difference in biofilm formation (Figure 3C and 3D). In both cases the biofilm was formed by the wild type strain and only few small patches of the mutant strains were detected. Thus, the competition experiments confirmed that type 3 fimbriae are essential for K. pneumoniae biofilm formation. The computer program, COMSTAT , was used to quantitatively analyse the biofilm formed by the wild type and its fimbriae mutants. Three different parameters, biomass, substratum coverage, and average thickness, were calculated from CSLM images of biofilms formed one, two and three days after inoculation. The average biofilm biomass level and thickness did differ over the three day period indicating continuous biofilm development and adaptation during the time period. At all timepoints, the wild type and the type 1 fimbriae mutant formed significantly more biomass per surface area than the two mutants lacking the ability to form type 3 fimbriae (C3091Δmrk and C3091Δfim Δmrk) (Figure 4A). No significant differences in biomass were detected between the wild type and the type 1 fimbriae mutant in the 1-3 days old biofilms. In contrast, a highly significant difference in biomass between the wild type and the type 3 fimbriae mutant (P < 0.01) and the type 1 and type 3 fimbriae double mutant was observed at all timepoints (P < 0.01). Quantitative analysis of biofilm formation by K. pneumoniae C3091 and its isogenic fimbriae mutants at different time-points by use of the computer program COMSTAT. A. Biomass. B. Substratum coverage (1 represents total coverage). C. Average thickness of biofilm. The mean and standard errors of the means are shown. Values were calculated from analysis of a minimum of seven images. Also the substratum coverage was significantly reduced for the type 3 fimbriae mutants in the 1-3 days old biofilms (Figure 4B). Both the type 3 fimbriae mutant and the type 1 and 3 fimbriae double mutant exhibited a much lower substratum coverage than the wild type (P < 0.01), whereas there was no significant difference between the wild type and the type 1 fimbriae mutant. The average thickness of the 1-3 days old biofilms formed by the type 3 fimbriae mutant and the type 1 and 3 fimbriae mutant was also significantly lower than for the wild type (Figure 4C) (P < 0.01), while there was no significant difference between the wild type and the type 1 fimbriae mutant. Thus type 3 fimbriae do not only mediate cell-surface attachment to the substratum, but are also important for cell-cell adherence. To verify that the attenuated biofilm formation of the type 3 fimbriae mutants was due to abolishment of type 3 fimbriae expression and not polar effects of the mutation, the type 3 fimbriae mutant was transformed with pCAS630 containing the C3091 mrk gene cluster . In contrast to the type 3 fimbriae mutant, the complemented mutant exhibited pronounced biofilm formation confirming the significant role of type 3 fimbriae in K. pneumoniae biofilm formation (Figure 5). In fact, the biofilm formation was even more prominent than for the wild type strain, likely due to enhanced type 3 fimbriae expression from the plasmid vector. Comparison of biofilm formation by the wild type, type 3 fimbriae mutant, and the type 3 fimbriae mutant transformed with pCAS630 containing the type 3 fimbriae gene cluster. Biofilm formation was examined in three independent experiments with similar results. Box sides 230 μm × 230 μm. Expression of K. pneumoniae type 1 fimbriae is regulated by phase variation mediated by an invertible DNA element (fim-switch). To investigate the expression of type 1 fimbriae during biofilm formation, the orientation of the fim-switch in cells forming biofilm was compared with the orientation in the bacterial suspension used to inoculate the flow-cells. The switch orientation was investigated for the wild type as well as the type 3 fimbriae mutant. In the inoculum suspension of the wild type, only fragments corresponding to the switch orientation in the "off" orientation were detected (Figure 6). Also in the cells from wild type biofilm only the "off" orientation was detected. Orientation of the fim phase switch in inoculum suspensions and biofilms of the wild type and type 3 fimbriae mutant (Δ mrk ). Lane M contained molecular size markers. Lane 1, wild type Inoculum; lane 2, wild type biofilm; lane 3, Δmrk inoculum; lane 4, Δmrk biofilm. The lower band intensity in lane 4 is likely related to the low level of biofilm formed by the type 3 fimbriae mutant. Interestingly, in the inoculum suspension of the type 3 fimbriae mutant both the "on" and the "off" orientation was detected, indicating that abolishment of type 3 fimbriae expression leads to up-regulation of type 1 fimbriae expression. However, as for the wild type, only the "off" orientation was detected in type 3 fimbriae mutant biofilms. Thus, type 1 fimbriae expression was established to be down-regulated in K. pneumoniae biofilms even when the biofilm forming strains were unable to produce type 3 fimbriae. The role of K. pneumoniae type 1 and type 3 fimbriae in vivo was recently investigated by our group [18, 19]. Type 1 fimbriae were established to be an essential virulence factor in K. pneumoniae UTI whereas expression of type 3 fimbriae had no influence on pathogenicity in an UTI animal model. Furthermore, neither type 1 fimbriae nor type 3 fimbriae were found to influence the ability to colonize the intestinal tract or cause lung infection. The virulence studies were conducted by use of non-complicated mouse models and it could be speculated that the influence of fimbrial expression on virulence may be different in complicated infections, e.g. infections related to use of indwelling devices such as catheters [18, 19]. It is well known that many pathogenic bacteria form biofilms on catheter surfaces, therefore we have in the present study characterized the influence of type 1 and type 3 fimbriae on K. pneumoniae biofilm formation. The K. pneumoniae wild type strain was found to form characteristic biofilms in a continuous flow system. Single cells attached to the substratum followed by proliferation whereby micro-colonies were formed. Spread of the biofilm likely occurs by release of cells from the micro-colonies that subsequently attach to the substratum down-stream of the colony whereby characteristic long colonies are formed in the flow direction. In competition experiments, where the flow chambers were incubated with equal number of different colour-tagged isolates (YFP- and CFP-tagged), the colonies in the biofilms consisted of either yellow (YFP)- or blue (CFP) -tagged cells, rather than a mix of two colours (Figure 3). This indicates that recruitment of planktonic cells does not play a significant role in K. pneumoniae biofilm development. If recruitment of planktonic cells played a major role, the biofilm would be a mix of YFP- and CFP-tagged cells. Thus, our results reveal that development of K. pneumoniae biofilm occurs primarily by clonal growth. The type 1 fimbriae mutant was found to be an as effective biofilm former as the wild type strain. Even when inoculated simultaneously with the wild type, the type 1 fimbriae mutant formed as much biofilm as the parent strain. Also quantitative analysis of the biofilms, using the computer program COMSTAT, revealed no significant difference in biomass, substratum coverage, and average thickness of the biofilm between the wild type and the type 1 fimbriae mutant. Equal amounts of substratum coverage indicate that type 1 fimbriae are not directly involved in cell-surface attachment. Furthermore, the similar biofilm biomass and thickness demonstrates that type 1 fimbriae are not involved in cell-cell adherence in the biofilm. Cover slips of borosilicate were used as substratum in our study and it can not be excluded that type 1 fimbriae may play a role in biofilm formation on other substratums. It was most intriguing, that type 1 fimbriae was not involved in biofilm formation as type 1 fimbriae are an essential virulence factor in K. pneumoniae urinary tract infection [18, 19] and seen to promote biofilm formation in E. coli[10, 27]. Therefore, we investigated whether this lack of impact of type 1 fimbriae on biofilm formation was related to down-regulation of fimbrial expression. Type 1 fimbriae expression is regulated by the fim-switch containing the promoter for the major fimbrial subunit fim A . The orientation of the fim-switch was investigated, in order to assess whether type 1 fimbriae were expressed during biofilm formation. Only the "off" orientation was detected from the C3091 wild type, demonstrating that type 1 fimbriae are down-regulated in biofilm forming cells. In contrast to the wild type, both the "on" and the "off" orientation was detectable in the inoculum suspension of the type 3 fimbriae mutants. Thus, abolishment of type 3 fimbriae expression was compensated by up-regulation of type 1 fimbriae, indicating cross-regulation of the two fimbrial gene clusters. We recently reported that the two fimbrial gene clusters are situated in close proximity on the K. pneumoniae chromosome, only interspaced by a 4.6 kb region which encodes putative regulatory genes . Experiments to elucidate the putative cross-regulation of type 1 and type 3 fimbriae expression have been initiated in our group. Although the type 3 fimbriae mutant expressed type 1 fimbriae in the suspension used to inoculate the flow chambers, only the "off" orientation was detected from the biofilm. Thus, even though the mutant was unable to express type 3 fimbriae, type 1 fimbrial expression was down-regulated, emphasizing that type 1 fimbriae do not play a significant role in biofilm formation. We previously demonstrated that type 1 fimbrial expression is up-regulated in wild type K. pneumoniae C3091 cells infecting the bladder (only "on" orientation detectable) but are down-regulated in C3091 cells colonizing the intestinal tract as well as when infecting the lungs (only "off" orientation detectable) . That the fim-switch in different scenarios, including biofilms, are only detected in the "off" or the "on" orientation indicates either that specific environmental signals induce switching to either the "on" or "off" position or alternatively, that the specific environments provoke a strong selection for either fimbriated or non-fimbriated bacteria. In our experiments, if expression of type 1 fimbriae promoted biofilm formation, a selection of type 1 fimbriae producing variants, would be expected to occur during biofilm formation. This would especially be the case for the type 3 fimbriae mutant as cells expressing type 1 fimbriae were already present in bacterial suspension used to inoculate the flow chambers. To our knowledge this is the first study which has investigated the influence of type 1 fimbriae on K. pneumoniae biofilm formation by use of well-defined isogenic mutants. It may be argued that the role of type 1 fimbriae in biofilm formation may be strain specific. However, supporting our findings, a previous study testing phenotypic expression of type 1 fimbriae in various K. pneumoniae isolates found that biofilm formation on plastic surfaces was not correlated with type 1 fimbrial expression . In E. coli , a very close relative to K. pneumoniae , type 1 fimbriae have been shown to promote biofilm formation [10, 27]. We are speculating that this intriguing difference may be related to the characteristic production of copious amounts of capsular material by K. pneumoniae strains. Indeed, it has been demonstrated that the presence of capsule is important for K. pneumoniae biofilm establishment and maturation . Furthermore, capsule expression has been shown to inhibit type 1 fimbriae functionality [31, 32]. Thus, it could be speculated, that up-regulation of capsule expression during biofilm formation inhibits type 1 fimbriae functionality, therefore type 1 fimbriae expression is down-regulated. Both the C3091 wild type and its fimbriae mutants are pronouncedly capsulated when grown on agar plates. We have initiated experiments to investigate the cross-regulation between capsule and fimbrial expression during K. pneumoniae biofilm formation. In contrast to type 1 fimbriae, type 3 fimbriae were found to play an essential role in K. pneumoniae C3091 biofilm formation. The type 3 fimbriae mutants formed only sparse biofilms in the flow chambers and were essentially outcompeted when in direct competition with the wild type. The COMSTAT results for both the type 3 fimbriae mutant and type 1 and 3 fimbriae double mutant revealed much lower substratum coverage than the wild type. This indicates that type 3 fimbriae are most important for initial cell-surface attachment. Furthermore, the lower amount of biomass and average thickness of the biofilms for the type 3 fimbriae mutants compared to the wild type and type 1 fimbriae mutant indicates that type 3 fimbriae also mediates cell-cell adherence in the biofilm. Our results confirm previous studies demonstrating that type 3 fimbriae are important for K. pneumoniae biofilm formation [29, 33]. Also in E. coli , the recently discovered ability to express type 3 fimbriae, mediated by conjugative plasmids, was found to profoundly enhance biofilm formation [16, 17]. Thus, type 3 fimbriae expression seems to generally promote biofilm formation in different bacterial species. We have previously established that type 1 fimbriae but not type 3 fimbriae are an essential virulence factor in K. pneumoniae urinary tract infections [18, 19]. The present study demonstrates how the impact of a specific virulence factor may vary significantly in different infection scenarios and host environments. Thus, although type 3 fimbriae may not be significantly involved in development of uncomplicated UTIs, our results indicates that type 3 fimbriae may be a significant virulence factor in CAUTIs since they promote biofilm formation on inert surfaces. Understanding the mode of bacterial growth in vivo during infection is important in relation to future therapeutic measures. In conclusion, the present work shows that type 3 fimbriae, but not type 1 fimbriae, mediate biofilm formation in K. pneumoniae C3091. As type 3 fimbriae promote adhesion to abiotic surfaces and biofilm formation in K. pneumoniae and other species, as shown here and by other studies [16, 17, 29, 33], type 3 fimbriae may generally play a significant role in development of catheter related infections such as CAUTIs. In this respect, the occurrences of conjugative plasmids encoding type 3 fimbriae in other species are worrisome. As the vast majority of K. pneumoniae isolates are able to express both type 1 and type 3 fimbriae , the use of epidemiological studies to elucidate the role of fimbriae in catheter associated K. pneumoniae infections is difficult. Thus further studies using catheterized in vivo infection models, are needed to further characterize the role of fimbriae in catheter related infections. C. Struve was partially financed by Danish Research Agency Grant 2052-03-0013. We would like to thank Professor Søren Molin, Centre for Biomedical Microbiology, Technical University of Denmark, 2800 Lyngby, Denmark, for providing flow chamber facilities. CSC, KAK and CST participated in the design of the study. CSC and CST constructed the fluorescently labeled strains and performed the fimbrial switch assays. CSC and KBB performed the biofilm experiments. All authors participated in data analysis and drafted the manuscript. All authors read and approved the final manuscript.